Fil-Am director Benito Bautista’s journey towards filmmaking began when he was just eight years old in Obando, Bulacan. His parents, both doctors, would bring him to spend the weekends at his grandparents’ home in the town of Balubad. With no one to play with, he initially resented these visits; but his grandfather managed to keep his mind occupied with his excellent storytelling. Soon, he was asking his parents to let him stay in Balubad longer. Bautista taught himself to paint when he was ten years old, but his family discouraged him from pursuing an art course in college. Instead, he took up business economics at the University of the Philippines to please his parents, who wanted him to easily land a job after graduation. In 1984, he immigrated to the U.S., settled in San Francisco, and followed a business career track by getting a position as a senior cost accountant at an apparel company. While working at graphs and numbers, he felt the lure of filmmaking; so he studied screenwriting, directing and cinematography at San Francisco Community College and Film Arts Foundation. After ten years as an accounting professional, Bautista had had enough. He left the company and worked as a security guard, sign designer and fabricator, petition signature gatherer and window cleaner. He says, “I never regretted my decision because it allowed me to have growth and artistic maturity as well as gain focus in my sense of storytelling.” He patiently worked at jobs, such as sound engineer, editor, cinematographer and production assistant, all towards his goal of becoming an independent filmmaker. 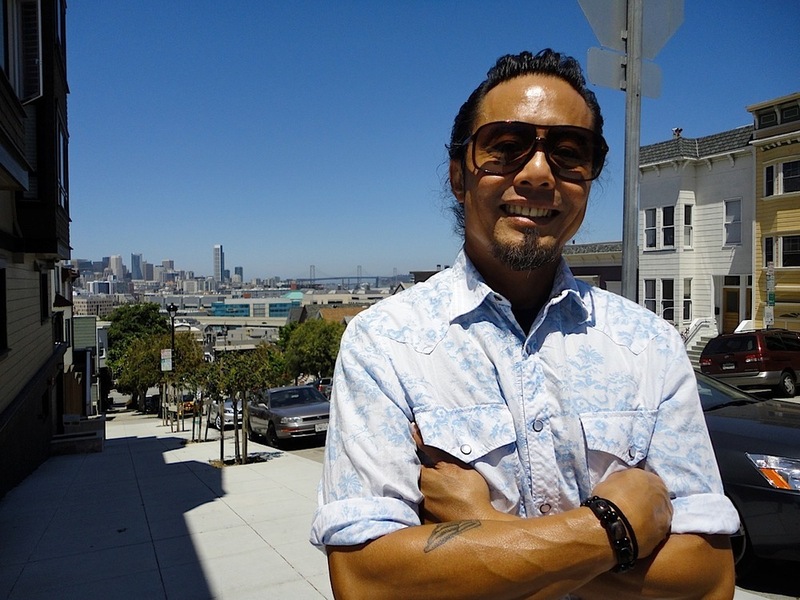 In 2001, Bautista set up Wanderlustprojectfilms, a production company based in San Francisco. “We shoot in any part of the world and recruit creative collaborators whenever necessary,” Bautista says. We live up to the meaning of ‘wanderlust,’ derived from a German word that connotes perennial traveling of spirit, physicality and mind.” During the next few years, he did short films, music videos and audiovisual projects, slowly honing his filmmaking craft. In 2006, in collaboration with John Rivera, Michael Rodriguez and Emma Francisco, also a partner at Wanderlust, Bautista released his first feature documentary “The Gift of Barong: A Journey From Within.” The film traces the sentimental visit of two Fil-Am surfers from the Bay Area to the Philippines and their emotional discovery of their roots as they soaked in the culture, learned more about their heritage and got to know the people. “The Gift of Barong” won the best cinematography award at the New York International Film and Video Festival and is now part of the Teacher’s Guide at Stanford University’s Program for International and Cultural Education. The filming of “Milk” about the life of openly gay S.F. Board of Supervisors member Harvey Milk in San Francisco in 2008 allowed Bautista to observe Hollywood techniques up close and personal. He served on the production design team and tried to absorb everything he could by watching renowned director Gus Van Sant and brilliant actors Sean Penn and James Franco in action. In 2011, Bautista switched genres by doing a gripping feature film called “Boundary,” which he shot in Manila with well-known Filipino actors for four days inside a taxicab. The title is derived from the local slang for the set amount that a taxi driver has to submit to the cab’s owner at the end of his or her work shift. A tense-filled late night ride of a driver, desperate to make his boundary, and his fare, a well-dressed man with mysterious intentions, touches on different facets of human conflict. The film received the Grand Jury Award at the Guam International Film Festival as well as recognitions at the Cinemalaya and Cinemanila film festivals in Manila. Bautista’s latest project, “Harana,” is a nostalgic film about a vanishing tradition of courtship in the Philippines, where a man, accompanied by a guitarist and a few friends, serenades a woman beneath her window. It was shown to much acclaim in Manila and at international film festivals from Dubai to Pusan, South Korea to different U.S. cities, including San Francisco, where it won the Audience Award at the recently concluded Center for Asian American Media Film Festival. As he begins to spread his directorial wings more globally, including plans for a future film in Africa, Bautista remains very excited about Pinoy stories expressed in cinema, particularly the disconnection of many second-generation Filipinos in the U.S. from their culture and heritage. He thinks that the positive reception of the Fil-Am community to his films “Barong” and “Harana” has validated his view that this issue continues to have a resonance with overseas Filipinos. Bautista’s passion for films is only matched by his great desire to project Filipino creativity on the world stage. He says, “I would like to make a film that will be accepted by a global audience and give me the chance to say that I have been influenced not only by my American experiences but that I represent a society, a worldwide Filipino diaspora that has a rich heritage filled with cultural traditions. Mila De Guzman is a freelance writer and a correspondent for Inquirer.Net. She is based in San Francisco.